Can the KeyMusician Keyboard take its place in a rock-band, among the wailing guitars and drum set? Certainly! Even though it doesn't look like any of the traditional instruments. It's a type of synthesizer, but doesn't require the 3-years of learning piano-keyboard technique. You can also play it standing, in a harness, so you can move expressively. But what instrument sound will you play? There are hundreds of quality sounds. The answer – any sound you want! 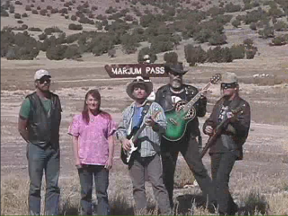 I have been improvising music, using the KeyMusician Keyboard, with a local rock-band called Marjum Pass, named for a pass in Utah's west desert. In this article, I'll give you some ideas for using the KeyMusician Keyboard in your own rock-band, and let you hear what it can sound like. There are no written music parts (to my knowledge) for doing this. What I did was strictly improvisation. But then, from observing the band in jam sessions, they seem to improvise their own parts in playing a new song (or an existing song), so this approach fits right in. The band leader asked me to “do my magic” with one of their original instrumental numbers, called Pink Buffalo. It was named acknowledging influences of Pink Floyd, as well as Buffalo Springfield. Note: On any of the links below, you can listen to it by clicking on the link. You could also download it by right-clicking on the link, and choosing “Save Link As” (or something similar) from the pop-up menu. I added a string ensemble track (violins, violas, and cellos) to it, and now, perhaps, we should add something to the name acknowledging influences of The Moody Blues. It uses the “String Ensemble 1” sound of the FluidR3_GM sound-font. I did this improvisation entirely in the melody section of the keyboard, playing my own chords, blending with, and morphing the existing harmonies in interesting directions, with a melody (done with my right hand) in the high violin range, adding an element of drama, like in a movie soundtrack. Listen for the violin/string-orchestra sound – that's me on the KeyMusician Keyboard. This may not be the best that you can think of, but nevertheless, notice the difference a single band member, playing the KeyMusician Keyboard can make. The string-orchestra sound is my current favorite in improvising with them. But I have also used different sounds. Here are several very short sound clips, illustrating the use of other sounds with the band. In this example, I'm using the Cello sound (of the FluidR3_GM sound-font). I think it provides a warm resonance along with the singing. In this next example, I add a background choir sound, using the “Choir Aahs” sound of the FluidR3_GM sound-font. In this next example, I'm using an instrument you wouldn't normally associate with a rock-band, yet it adds an interesting, pleasant sound to the melody. It's using the Flute sound of the FluidR3_GM sound-font. In this final short clip, I'm adding additional lead-guitar melody, using the “Distortion Guitar” sound of the FluidR3_GM sound-font. This final piece, is in the opinion of the band leader, one of the band's best compositions. It's an instrumental number, called “Gun-Fighter”. As with the “Pink Buffalo” piece above, I improvised a string-orchestra track with it, giving it more of the sound of a movie soundtrack. Thanks for reading and listening. I hope it gives you ideas for rocking the hall using your KeyMusician Keyboard! You can return to the index of newsletter articles by clicking the link below.